Singer-songwriter Beki Hemingway has been on the music scene for a while now. She worked with singer-guitarist Jonathan Rundman on a few of his CDs, and contributed to the Big Fish Little Fish - Emerging Women In Chicago Music compilation. 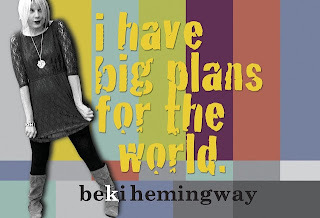 Hemingway has since moved to Colorado, where she and husband, guitarist-producer Randy Kerkman, recorded I Have Big Plans For The World, with co-producer-guitarist Scott Smith and a handful of guest musicians.